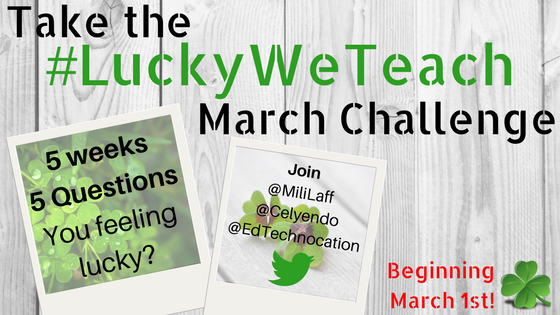 EdTechnocation: Take the #LuckyWeTeach March Challenge With Us! Take the #LuckyWeTeach March Challenge With Us! Did you participate in the #14DaysofTeachingLove Challenge back in Feburary? I was challenged by @MiliLaff to participate and it was a great experience for several reasons! We were so inspired that a few friends and I decided to create one for March. Join us for the #LuckyWeTeach March Challenge. Jump in to the post to see the questions and learn how to join! There are so many things that we, as educators, are lucky to have in our classrooms, schools, communities, and PLNs! The #14DaysofTeachingLove challenge helped me to reflect on the things that I love the most about teaching. I blogged about my responses to the #14DaysofTeachingLove Challenge here! 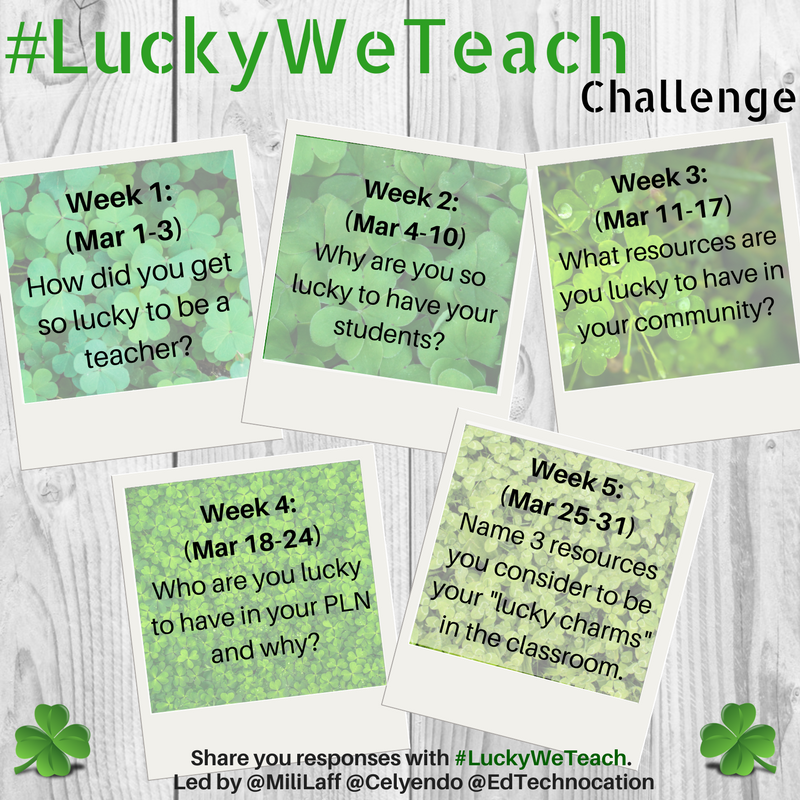 Sarah Milianta (@MiliLaff), Celeste Endo (@Celyendo), and I (@EdTechnocation) want to continue that experience in March so we worked together to create the #LuckyWeTeach March Challenge! 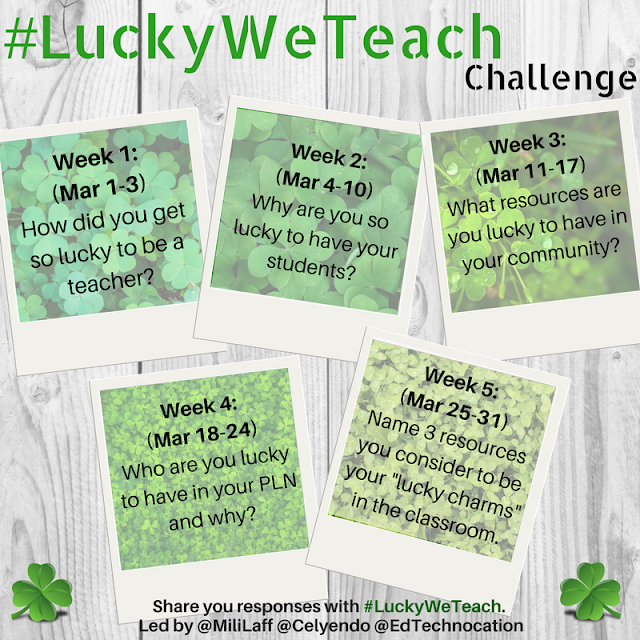 The #LuckyWeTeach March Challenge is an opportunity for educators to reflect on the people and things they are lucky to have in their lives. For each week in March we've created a question or prompt that we would love for all of you to respond to on Twitter using the hashtag #LuckyWeTeach. You can share your responses to each question anytime during the week and feel free to Like, Retweet, and reply to others! Week 1 (Mar 1-3): How did you get so lucky to be a teacher? What is your educator origin story? Week 2 (Mar 4-10): Why are you so lucky to have your students? What makes them so amazing? Week 3 (Mar 11-17): What resources are you lucky to have in your local community? Week 4 (Mar 10-24): Who are you lucky to have in your PLN (Personal Learning Network)? Week 5 (Mar 25-31): Name 3 resources you consider to be your "lucky charms" in the classroom. Help us get #LuckyWeTeach Trending on Twitter! Follow us and mention us in your #LuckyWeTeach tweets!